Yoke Sun & Wee Han are from KL and Johor respectively but both kinda met & knew from a basketball tournament in the same engineering factory they worked in Penang. How small a world could be? Being a wedding photographer is really an interesting occupation as I get to know everyone's love story whether they like it or not. lol. Seriously, not for any other purposes but just in hoping that I get to know more about them in the shortest time possible while producing photographs that tags nearest to the couple's real self. Something worth mentioning is that Wee Han is an awesome hubby many girls dreamt of cause he loves to cook! He even made me and Joan some nice sandwiches when we were there for the makeover early in the morning. 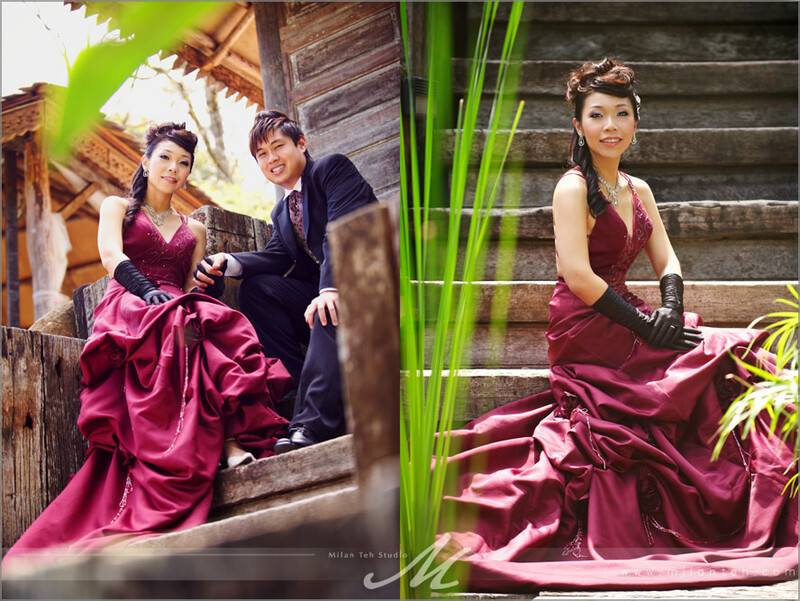 Now here's my favorite picks for their Love Diary session done wholly in Penang and with Sol Cover's dinner gown. Have a great great weekend ahead everyone! &.b.t.w. - The first shot was not a sunrise but a 'Flash Rise' with Joan's help. Cause when we start to shoot, the sky was actually gloomy and rained a bit too, that explains where the rainbow comes from. &.&.&.b.t.w. - We did an online contest namely All About U + U recently. Today is the last day of voting(with Likes), hope that some of you could help these participants to win a prize from us. Thanks! &.&.&.&.b.t.w. - One of the series were done in a very nice resort now called Fig Tree Hill Resort, when we shot it, the place were still in the midst of construction and hasn't got an official name yet. If you like to get in one with nature and fancy beautiful Bali style of accommodation, this place is definitely for you all at the luxury in Penang!